BOSTON, Mass. - The No. 8 Northeastern men's hockey team (15-7-1, 9-5-1) peppered Friar goaltender Hayden Hawkey with 34 shots, but could not solve the netminder as No. 14 Providence (15-7-4, 8-5-1) received goals from three different scorers en route to a 3-0 victory on Saturday night at Matthews Arena. 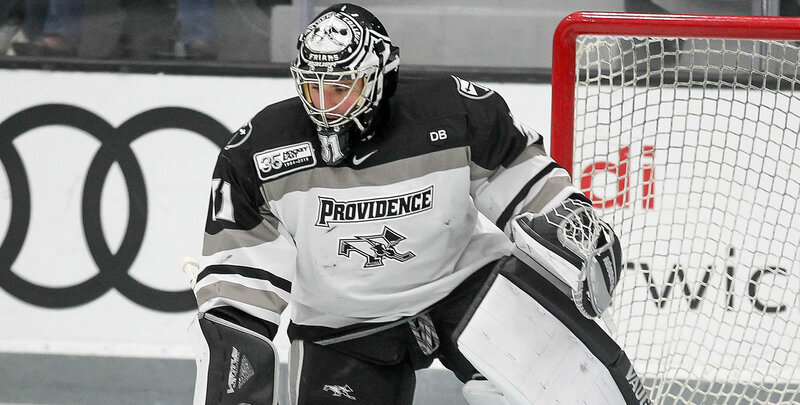 The effort was there for the Huskies throughout the evening, who tossed 26 shots on goal during the opening two periods, including eight on the power play, but Hawkey from stellar from start to finish to backstop the Friars to the weekend sweep. Cayden Primeau made 26 saves for Northeastern, including 13 in the third period alone. Providence found the back of the net once per period, beginning with a power play strike from Tyce Thompson 12 minutes in when he finished off tic-tac-toe passing from Josh Wilkins and Brandon Duhaime to give the Friars the 1-0 lead through 20 minutes. Vincent Desharnais potted his second of the season less than two minutes into the middle frame when he settled a pass from John McDermott at the point and fired a shot through traffic and snuck past Primeau for the score. Jack Dugan closed out the scoring with 8:53 left in regulation when he tucked home a rebound on the doorstep off an initial shot from Spenser Young at the right side. The Huskies will be back in action next Friday night when Northeastern hosts No. 19 UMass Lowell at Matthews Arena. Puck drop is set for 7 p.m. and tickets are available by visiting NUHuskies.com/tickets.